Book a Wedding Band | Book Direct - No Agency Fees! When it's time for the Wedding Day Celebrations to move into party mode, a great Wedding band is the ultimate asset. 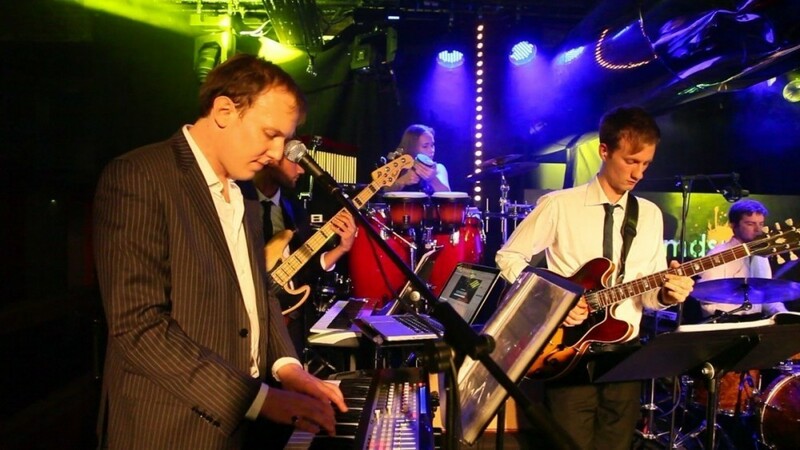 Mainly, a Wedding Band will entertain your guests with a fantastic live show that will put the wow factor into celebrations and encourage everyone of all ages to let their hair down and enjoy themselves. You can read more about what you should know about choosing and booking a wedding band below. Find a Wedding Band for hire near you in minutes! Option 1. Enter your event location below & contact a Wedding Band directly! Option 2. Request multiple quotes from available Wedding Bands Get Quotes! Option 3. Read information & advice on hiring Wedding Bands Read Advice! There are so many things to consider when you’re planning your big day, with everything to organise from the all-important wedding dress, to the seating plan and flowers. But when it comes to creating a truly memorable day, with a wonderful atmosphere, few things could be more important than the type of music you choose. There are many ways to bring music into your wedding day, you could hire a harpist or violinist to play during the the ceremony - take a look at the selection of musicians and singers available to provide music at your wedding ceremony. Booking a DJ for the reception will get your guests dancing but the versatility of a wedding band and the feel-good vibe they bring is an ever-popular choice. Read on for a quick summary to help you decide if a band is right for your very special occasion, and to give you an idea of some of the types or bands available and practicalities of booking. For a more detailed guide, covering everything you could ever need to know about booking a band, take a look at our Complete Guide here. IS A WEDDING BAND RIGHT FOR MY EVENT? A wedding band can be very versatile in terms of the all-round service they offer and are a great way to keep your guests entertained throughout the day. Here are a few of the ways that they can bring that extra note of romance and fizz of energy to your beautiful wedding. A band can be hired to play right from the beginning of your event, all the way from the drinks reception, through to the exciting minutes before the bride appears and during that breathless and timeless moment when the bride steps out to walk down the aisle during the ceremony. There are so many romantic classics to choose from and any of these can be played softly in the background, heightening the emotion and setting the perfect tone for one of the biggest moments of your lives. After the excitement and high emotion of the ceremony, it can be very soothing and enjoyable to have some musical accompaniment both as your guests walk in to the room where they will have the wedding breakfast and also while they are chatting and eating. Music can help create a joyful mood and make it easier for guests to break the ice with their neighbours. Many wedding bands are experts at choosing just the right music for every occasion, so don’t hesitate to ask them to recommend some background songs for this part of your day. This is the moment when wedding bands really come into their own. When the time comes to get those toes tapping, there is no better way to re-energise your guests than a fun and funky live band. A DJ can certainly get everyone to the dance floor, but there is something so much more entertaining about live music and the atmosphere that a band can create. They can really work the audience, emceeing and talking to your guests, choosing just the right numbers and the right tempo to get you all the way through from the first dance to the last, making sure that no one wants to leave the dance floor. Some bands offer additional services, such as bandaoke, adding the extra entertainment of letting everyone have a go at being the lead singer, or providing a DJing service after they have finished their set. You can check all of this when you contact our bands direct. What sort of wedding band do I need? We have a vast selection of wedding bands to suit every style, theme and requirement in our vast directory. So where do you start? If you’re planning to give your wedding a particular theme, such as vintage or rock and roll, then choosing a wedding band that looks and plays the part is a wonderful way to set the scene. If you’re looking for more general music and entertainment then many of our bands will play a variety of genres and eras, covering everything from the 1920s to chart and dance music. One thing to consider is whether you are looking for a band to play covers of songs in the original style or whether you would like a band that can really make songs their own, bringing their special slant and energy to the songs that everyone knows and loves. Many of our bands have playlists or videos on their profiles, and this is a great way to gauge what kind of tone they will create – from big band sounds, professional function / party bands to Jazz funk and soul. Whatever type of band you decide on, we have a varied selection of performers in your area, from the UK in London or further North, to the US, anywhere from California to New York. Pandoras Jukebox - One of the leading wedding bands in London and the UK bookable through Entertainers Worldwide. The main thing you will need to consider is your budget. This will depend on the number of band members, how experienced they are and how far they have to travel to your event. There are plenty of practical considerations that you should keep in mind when booking a wedding band, from the size of the area you have, to the length of the set and your budget. We’ve got all of this covered in our extensive article ‘Your Complete Guide to Booking a Live Band or Group!. Just take a look to find out everything you could ever need to know about the whens, wheres and hows of hiring one of our amazing acts for your event. The quickest way to find the right band in your area is to use our search function. Just add your location and the type of band you need and click search to see a huge variety of acts to choose from. Our latest testimonials are also a fantastic way to start getting some ideas for your shortlist. Even better, if you would rather entertainers came to you, you can request multiple quotes here, and this service is completely free! Once you’ve found your ideal band, just contact them direct! To help you remember everything you may want to ask, as well as the nitty-gritty of bookings don’t forget to take a look at our article ‘Your Complete Guide to Booking a Live Band or Group!'. Booking that perfect band can make all the difference to your special day, and we know we have exactly the right band on here waiting to create a joyful atmosphere for your event. We hope you enjoy your search, but do contact us if you need any help.